Combine your two bucket dollies into one convenient wash system. 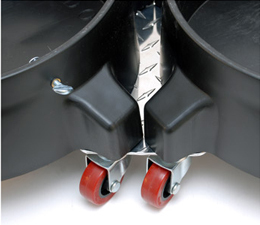 The Diamond Plate Dolly Connector connects your two bucket dollies to make detailing more convenient. Now you can roll two buckets with you around the vehicle as you work, saving you time and effort. 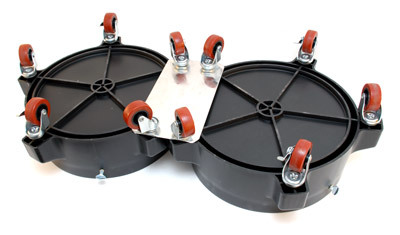 The Diamond Plate Dolly Connector is perfect for detailers, painters, and construction workers. The aluminum dolly connector is rust resistant and built to last. Use the Diamond Plate Dolly Connector with the 5 Gallon Wash Bucket System With Dolly. It turns two dollies into one! Simplify the car wash with the Diamond Plate Dolly Connector. With both buckets connected, your two-bucket system will always be close at hand. The Diamond Plate Dolly Connector makes it easy to roll your wash buckets within easy reach while detailing. 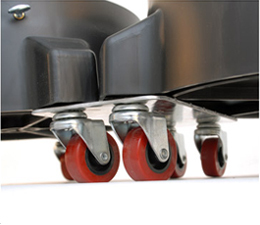 The Dolly Connector does not interfere with the function of the wheels. Buckets and dollies sold separately. REALLY EASY TO INSTALL AND VERY STRONG TO KEEP BOTH DOLLIES TOGETHER. Costly, but it does the trick. This diamond plate connector works well enough to connect the 2 units. However, it seems pretty expensive for such a thing. Additionally, i wish the connection itself was a bit stronger.